In fertilization, the sperm binds to the egg, allowing their membranes to fuse and the sperm to transfer its nucleus into the egg. A mammalian egg is covered by a layer of glycoproteins called the zona pellucida, which the sperm must penetrate in order to fertilize the egg. Upon binding with the egg, the sperm initiates the acrosome reaction, in which it releases digestive enzymes that degrade the zona pellucida, allowing the plasma membrane of the sperm to fuse with that of the egg. Upon fusion of the two plasma membranes, the sperm’s nucleus enters the egg and fuses with the nucleus of the egg. Both the sperm and the egg each contain one half the normal number of chromosomes, so when they fuse the resulting zygote is a diploid organism with a complete set of chromosomes. When the egg is successfully fertilized, it releases proteins that prevent it from being fertilized by another sperm, a condition known as polyspermy. Fertilization is the process in which gametes (an egg and sperm) fuse to form a zygote. The egg and sperm are haploid, which means they each contain one set of chromosomes; upon fertilization, they will combine their genetic material to form a zygote that is diploid, having two sets of chromosomes. A zygote that has more than two sets of chromosomes will not be viable; therefore, to ensure that the offspring has only two sets of chromosomes, only one sperm must fuse with one egg. In mammals, the egg is protected by a layer of extracellular matrix consisting mainly of glycoproteins called the zona pellucida. When a sperm binds to the zona pellucida, a series of biochemical events, called the acrosomal reaction, take place. In placental mammals, the acrosome contains digestive enzymes that initiate the degradation of the glycoprotein matrix protecting the egg and allowing the sperm plasma membrane to fuse with the egg plasma membrane. The fusion of these two membranes creates an opening through which the sperm nucleus is transferred into the ovum. Fusion between the oocyte plasma membrane and sperm follows and allows the sperm nucleus, centriole, and flagellum, but not the mitochondria, to enter the oocyte. The nuclear membranes of the egg and sperm break down and the two haploid genomes condense to form a diploid genome. This process ultimately leads to the formation of a diploid cell called a zygote. The zygote divides to form a blastocyst and, upon entering the uterus, implants in the endometrium, beginning pregnancy. Process of fertilization: (a) Fertilization is the process in which sperm and egg fuse to form a zygote. (b) Acrosomal reactions help the sperm degrade the glycoprotein matrix protecting the egg and allow the sperm to transfer its nucleus. A zygote undergoes rapid cell divisions (cleavage) to form a spherical ball of cells: the blastula; this will further develop into a blastocyst. A single-celled zygote will undergo multiple rounds of cleavage, or cell division, in order to produced a ball of cells, called a blastula, with a fluid-filled cavity in its center, called a blastocoel. In animals with little yolk in the egg, the zygote undergoes holoblastic cleavage, in which the entire zygote is cleaved repeatedly; in animals with a lot of yolk in the egg, the zygote undergoes meroblastic cleavage, in which only part of the zygote is cleaved. The blastula eventually organizes itself into two layers: the inner cell mass (which will become the embryo) and the outer layer or trophoblast (which will become the placenta ); the structure is now called a blastocyst. During gastrulation, the blastula folds in on itself to form three germ layers, the ectoderm, the mesoderm, and the endoderm, that will give rise to the internal structures of the organism. The development of multi-cellular organisms begins from a single-celled zygote, which undergoes rapid cell division to form the blastula. The rapid, multiple rounds of cell division are termed cleavage. After the cleavage has produced over 100 cells, the embryo is called a blastula. The blastula is usually a spherical layer of cells (the blastoderm) surrounding a fluid-filled or yolk-filled cavity (the blastocoel). Mammals at this stage form a structure called the blastocyst, characterized by an inner cell mass that is distinct from the surrounding blastula. During cleavage, the cells divide without an increase in mass; that is, one large single-celled zygote divides into multiple smaller cells. Each cell within the blastula is called a blastomere. In mammals, the blastula forms the blastocyst in the next stage of development. Here the cells in the blastula arrange themselves in two layers: the inner cell mass and an outer layer called the trophoblast. The inner cell mass is also known as the embryoblast; this mass of cells will go on to form the embryo. At this stage of development, the inner cell mass consists of embryonic stem cells that will differentiate into the different cell types needed by the organism. The trophoblast will contribute to the placenta and nourish the embryo. 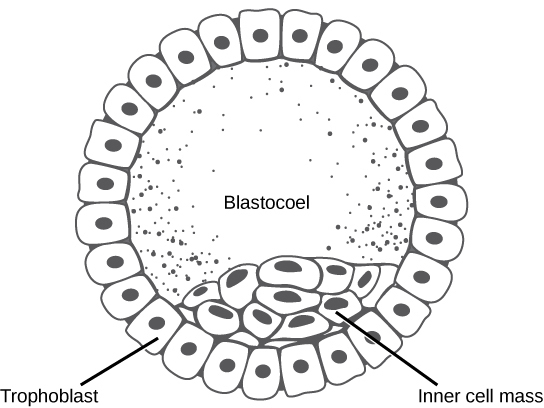 Formation of the blastocyst: The rearrangement of the cells in the mammalian blastula to two layers, the inner cell mass and the trophoblast, results in the formation of the blastocyst. The typical blastula is a ball of cells. The next stage in embryonic development is the formation of the body plan. The cells in the blastula rearrange themselves spatially to form three layers of cells in a process known as gastrulation. During gastrulation, the blastula folds upon itself to form the three layers of cells. Each of these layers is called a germ layer, which differentiate into different organ systems. Differentiation of germ layers: The three germ layers give rise to different cell types in the animal body: the ectoderm forms the nervous system and the outer layer of skin, the mesoderm gives rise to muscles and connective tissues, and the endoderm gives rise to the lining of the digestive system and other internal organs. The three germs layers are the endoderm, the ectoderm, and the mesoderm. The ectoderm gives rise to the nervous system and the epidermis; the mesoderm gives rise to the muscle cells and connective tissue in the body; and the endoderm gives rise to columnar cells found in the digestive system and many internal organs.